Graham A. Jamieson was former research director of American Red Cross Blood Services. Dr. Jamieson worked for the organization for 38 years. He oversaw major growth in the program and expanded into new scientific and technical fields. Born in Wellington, New Zealand, Dr. Jamieson graduated from the University of Otago there, where he also received a master's degree in science in 1951. He received a doctorate in organic chemistry at the University of London's Lister Institute of Preventive Medicine in 1954. He later received a second doctorate in organic chemistry and biochemistry in 1972, also from the University of London. Research fellowships took him to the Royal Technical University in Stockholm from 1955 to 1956 and then to the Cornell Medical College in New York in 1956 and 1957. He then joined the National Institutes of Health in Bethesda, USA as a visiting scientist. 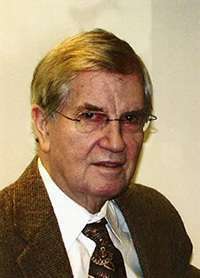 In addition to Dr. Jamieson’s long and distinguished career as an innovative scientist and leader in biomedical research and development, he was a charter member of The International Society on Thrombosis and Haemostasis and an active worker in the Scientific and Standardization Committee. He served on the Central Committee of the SSC from 1991 to 1997 and was the recipient of the Shirley A. Johnson Memorial Lectureship at the XVI ISTH Congress in Florence, Italy.